This is the Cape May Birding Hotline, a service of New Jersey Audubon's Cape May Bird Observatory. This week's message was prepared on Thursday, August 30, 2012. Included this week are sightings of REDDISH EGRET, BLACK-BELLIED WHISTLING-DUCK, BLACK SCOTER, BROWN PELICAN, AMERICAN GOLDEN-PLOVER, UPLAND SANDPIPER, HUDSONIAN GODWIT, RED KNOT, BAIRD'S SANDPIPER, BUFF-BREASTED SANDPIPER, WILSON'S PHALAROPE, BLACK TERN, EURASIAN COLLARED-DOVE, OLIVE-SIDED FLYCATCHER, RED-BREASTED NUTHATCH, GOLDEN-WINGED WARBLER, "BREWSTER'S" WARBLER, PROTHONOTARY WARBLER, CLAY-COLORED SPARROW, LARK SPARROW, DICKCISSEL, and PURPLE FINCH. New Jersey's second-ever REDDISH EGRET was seen again at Brig/Forsythe NWR on 8/24 and 8/27, but has not been reported since. Other sightings from "Brig" this week included the continuing BLACK-BELLIED WHISTLING-DUCK, a HUDSONIAN GODWIT on 8/28, and 2 WILSON'S PHALAROPES on 8/25. An excellent songbird flight occurred on 8/29, with highlights from the Higbee Dike consisting of 374 RED-BREASTED NUTHATCHES (a record count for CMBO's Morning Flight project), 4 early PURPLE FINCHES, 2 LARK SPARROWS, 2 DICKCISSELS, an OLIVE-SIDED FLYCATCHER and a "BREWSTER'S" WARBLER. A CLAY-COLORED SPARROW passed the dike on 8/27, while a GOLDEN-WINGED WARBLER and a PROTHONOTARY WARBLER were tallied there on 8/25. Two UPLAND SANDPIPERS briefly visited the Higbee Dike on 8/29, and a flock of 8 HUDSONIAN GODWITS were seen flying south past the Dike on 8/25. A fly-by WILSON'S PHALAROPE was snagged from the South Cape May Meadows on the evening of 8/28, and at least 580 RED KNOTS were noted at Stone Harbor Point on 8/27. Farther afield, at least 4 AMERICAN GOLDEN-PLOVERS, 2 BAIRD'S SANDPIPERS and a BUFF-BREASTED SANDPIPER have been noted at the Johnson Sod Farm (Cumberland Co.) during the past few days. 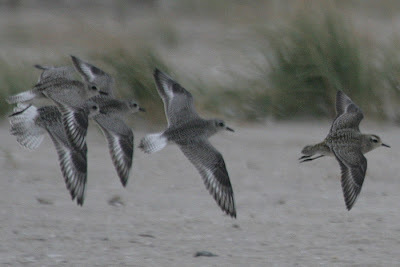 A BUFF-BREASTED SANDPIPER was also noted at North Brigantine Natural Area on 8/28. 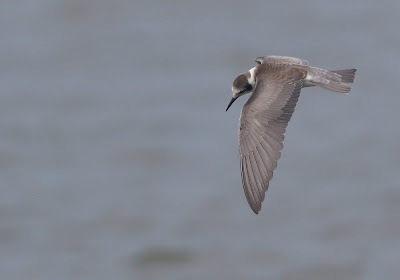 BLACK TERN numbers have dwindled somewhat in the past week, though up to two dozen can still be found most mornings in the mouth of Delaware Bay. WILSON'S STORM-PETRELS continued to be seen from the Cape May-Lewes Ferry, while 25 BROWN PELICANS and a BLACK SCOTER were sighted from the Higbee Dike on 8/24. Cape May Point's resident EURASIAN COLLARED-DOVES continue to show regularly in the area of Yale, Whildin and Harvard Avenues. Pelagic birding has been referred to as the last frontier in birding in North America as well as elsewhere. 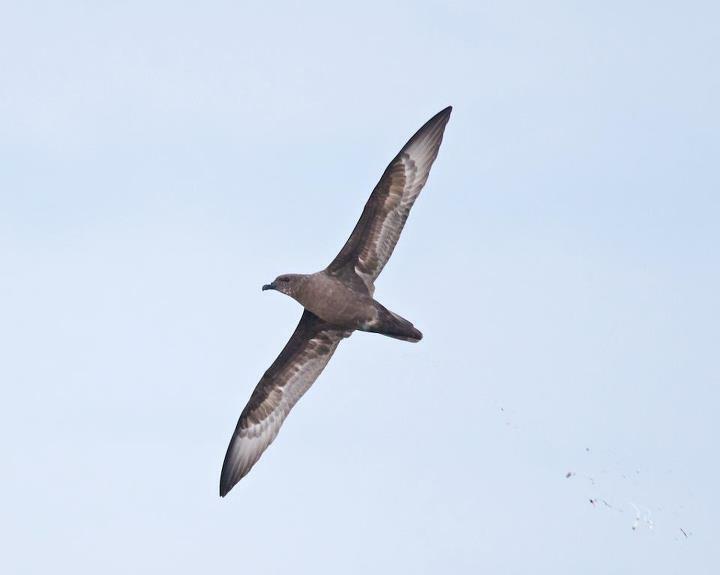 There is a vast amount of knowledge about the occurrence and movements of birds throughout the continent but there are huge gaps in our pelagic knowledge. For example, it is only in the past decade that we've discovered how regular Dovekies are off our coasts, and exactly what we have to do to find them. Much of this has to do with the expense and effort required to go pelagic birding, so every trip ends up being a bit of a learning experience. All of that being said two nearby pelagic trips out of Lewes, DE and Hyannis, MA were both separately described as "epic". Let me retype that. "EPIC!!!" Rarities and numbers were off the charts. This total is just insane outside of the Outer Banks, NC. Just 10% of this count would have set a new high count for the state. Toss in an Arctic Tern in MD as well as a juvenile Long-tailed Jaeger and an adult Bridled Tern even closer in DE waters and you have the makings for the best summer trip I've ever been on in the Mid-Atlantic. 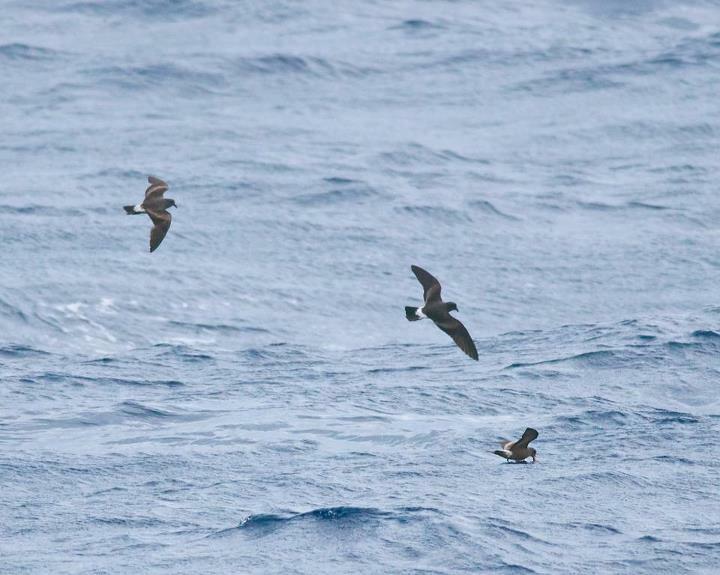 We also tallied numbers of the more expected Cory's, Great, and Audubon's Shearwaters, Wilson's Storm-Petrel, and Red-neck Phalarope as well as one sneaky Manx Shearwater that I photographed when it flew through my camera's field of view but never got a chance to actually ID. 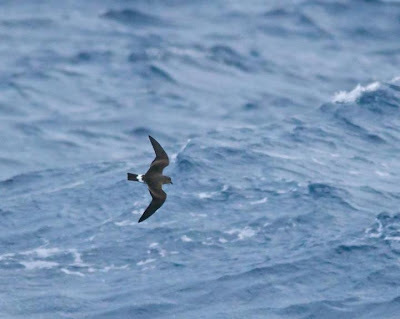 On the same weekend, the trip out of Hyannis also hit it out of the park by tallying 2 Barolo's (formerly Little) Shearwaters, a Red-billed Tropicbird, 7 White-faced Storm-Petrels, 9 Band-rumped Storm-Petrels, dozens of Leach's Storm-Petrels, as well as the more expected species. 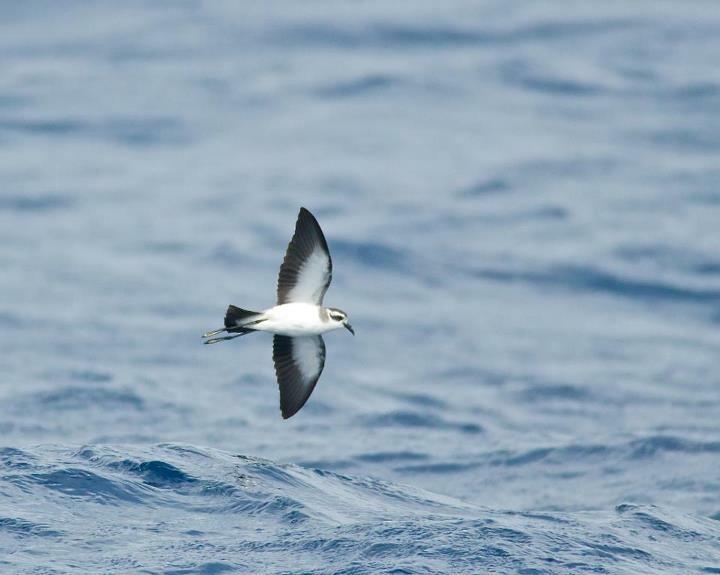 So what has brought us this bounty of rare pelagic birds? Well it can be tough to say exactly what is happening at sea, but several factors seem to currently be in our favor. First, the Gulf Stream influence seems to be reasonably close to our shores. Not close enough to easily reach the stream itself on a one day trip, but close enough. Second, our weather pattern has seen nearly two weeks of systems pumping up storms from our south. And finally, we had several days of east winds. So what does this mean for the near future? Well we plan to find out. Our next pelagic is scheduled to sail from Wildwood Crest, out of the Cape May inlet, and out roughly 100 miles off the edge of the Continental Shelf where the water is over 1,000 fathoms (6,000 feet) deep to see if we can find some of these goodies again. A trip last September on this same boat found multiple Bridled Terns, Long-tailed Jaeger, and some of the more expected species. If you're interested in joining us or want more information, drop us a line at info@paulagics.com or call us at 215-234-6805. Personally, I can't wait to visit the birding frontier again! All photos below are courtesy of Paul Guris and are from last Saturday's trip out of Lewes, Delaware - enjoy! Purple Martins, what do they do here? Purple Martin is a common and well-loved species that breeds in Cape May in widely scattered colonies in human-provided condominiums. They prefer box sites that have extensive uncluttered space around them and, typically, well above the ground. 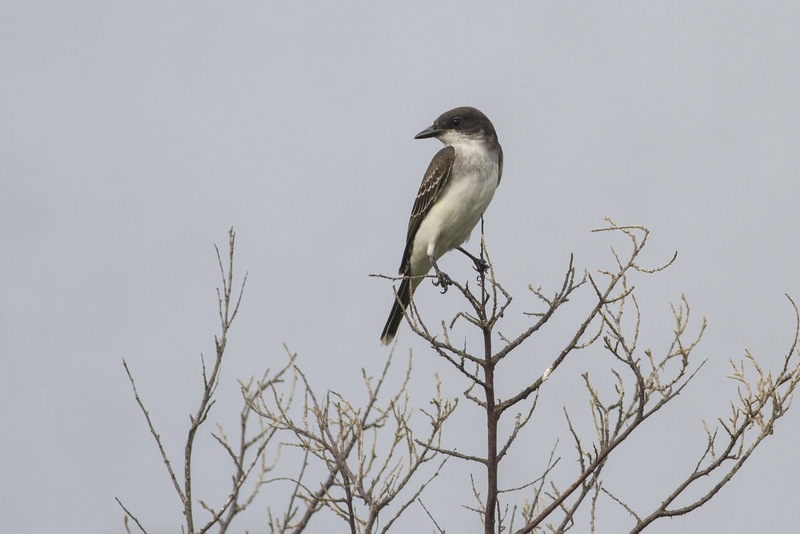 The very first migrants of spring are usually spotted in early March, though this spring saw the area's first February records, the first in Cape May Point on the 26th. Regardless of how early the first migrant may appear, however, local colonies are not attended, often, until early April, probably because of the depressing effect on spring of all that surrounding cold water. However, the focus of this essay is on what the species and individuals do here in fall. The Mauricetown-area (Cumberland Co.) staging area is well known, with martins starting to concentrate there in numbers in July and continuing to accumulate into August, with counts often exceeding 35,000 (this year's counts were through the roof, from what I understand). But, again, I am more immediately interested in what they do in lower Cape May Co. Many fall mornings, I wake up to the same conundrum, go to the Higbees Beach SWA dike and join in the fun there counting the morning flight (and not really having to have to do any actual counting), or stay at my north Villas home and count the same flight line from my house, with the concomitant possibility of new yard birds, but, with the self-imposed duty to actually count everything. And, for anyone that thinks that the task of the morning-flight counter -- other than identifying everything -- is not that hard, come stand under this flight when it's scattered over an east-west distance of a quarter-mile, with birds at a large variety of altitudes and see what you think. Anyway, the Purple Martin flight at my house has had my attention for a few years, now, and I still do not really understand it. 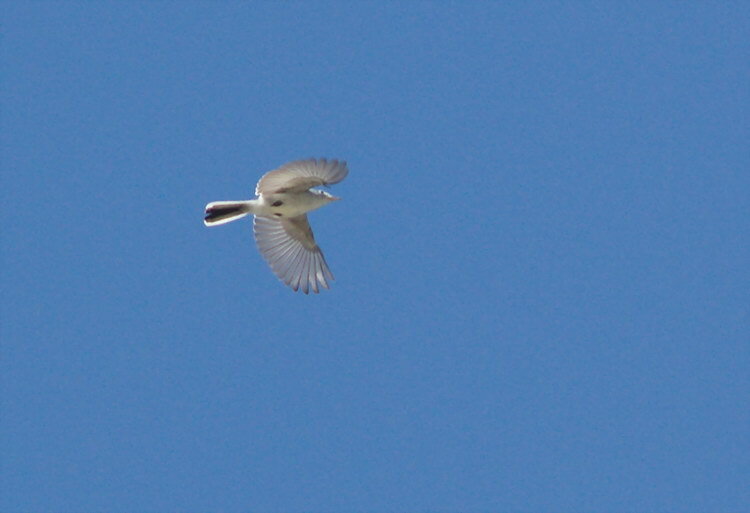 From the efforts of many on Cape Island, we have a general sense of how birds arrive to take part in the nearly daily phenomenon of fall northbound morning flight over Higbees, but that general sense is for species in general, but particularly for small, nocturnally migrating passerines. Our understanding does not seem to stretch to all diurnally migrating birds, and swallows, particularly Purple Martins, seem to do something quite different. 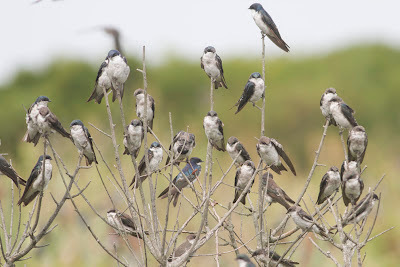 That is because, nearly every time that I count a big flight of martins at my house, the folks at the Higbees dike did not experience the same flight. This difference between two otherwise similar sites that are just 5 miles apart (as the Peregrine flies) at a bearing of just east of north (14 degrees) has had me flummoxed, particularly as the flight is otherwise quite similar. Yesterday provided, unknowingly to me, a chance to prove that difference. I made the decision the previous night to go to the dike, getting there before sunrise and had a wonderful morning there (see the details in Cameron Rutt's post). When Purple Martins starting flying by us, because the morning-flight count does not tally them, I had a clicker ready in my pocket and started counting them. By the end of the flight, I had counted 112, not a bad count for so late in the species' occurrence time here. This morning, Jim Dowdell called me to ask me whether I had counted Purple Martins at the dike (apparently, some know me far too well! ), because he had watched a huge flight of them go over his house yesterday morning. Jim lives just a bit north of equidistant between my house and the Higbees dike in south Villas; his house, too, is right under the flight line. Jim watched "thousands" go north past his house on the Delaware Bayshore yesterday and, presumably, those birds kept going north past my house, too. So, Purple Martins (and, I think, other swallow species) deal with the Cape May peninsula quite differently than do many other passerine species. What we need to figure this out, is to have folks look from other places (e. g., the West Cape bridge) to see where those thousands of Purple Martins are south of Villas before they hit the Bayshore and turn north, because it is decidedly somewhere not as far west and south as the Higbees Beach SWA dike. Fall is officially off the starting blocks so if you weren't at Cape May this morning you missed it! But there will of course be many great days to come so there will be plenty of opportunity for you to come down and be part of the fun. But that first big day, that first feeling that Fall really is now upon us is always special. The weather forecasters were right and Tom Reed alluded to it in a recent blog post and those that were up on Higbee Dike this morning certainly got their money's worth. Best of all was the record count of 374 Red-breasted Nuthatches, with reports of the same species coming from all around Cape Island - even at the Coastguard Unit! Two Lark Sparrows, two Buff-breasted Sandpipers and an Olive-sided Flycatcher were nice additional birds at the dike too. Cameron Rutt will post the full list from the dike in due course on our Seasonal Research page. On my regular Wednesday morning walk today there was much movement in evidence too; warblers and Bobolinks could be heard overhead, small parties of Purple Martins came back in off the bay and a steady run of Red-winged Blackbirds and Brown-headed Cowbirds was in evidence. 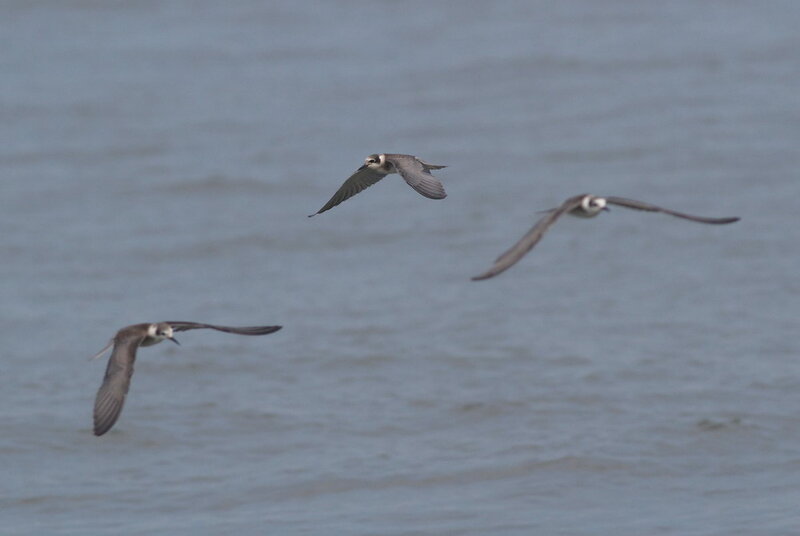 All the heavy rain we experienced over the weekend had put paid to shorebirds on Bunker Pond, for the next few days at least, but Black Terns continue to enjoy the beach and there was the added bonus of visible bat migration! Yes, bats were on the move and we saw three Red Bats zooming along the dune line in broad daylight, one of which we were able to scope as it hung itself up in a bayberry bush to rest. Hawks too were on the move - at least three American Kestrels, Merlin, Cooper's Hawk, Bald Eagle, several Ospreys and four Northern Harriers were logged this morning, with the highlight being the fine sight of two adult male Northern Harriers flapping south, high over the Delaware Bay. 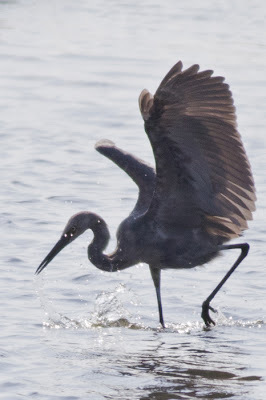 Brigantine and New Jersey's Reddish Egret certainly played hardball with the region's birders; staying until last Friday, it failed to show for the weekend crowds, then re-materialized back at its favorite spot on Monday! Guess I'll have to wait for the next one... [photo by Lisa Ryan]. 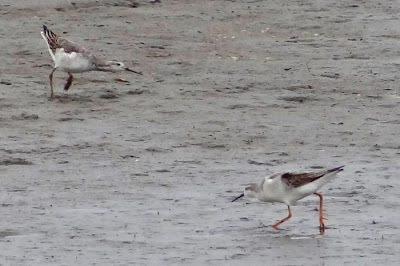 These two Wilson's Phalaropes put on a good show for admirers at Brigantine. Unlike other phalarope species, Wilson's Phalaropes will spent much time feeding on dry land, usually adopting a manic chasing style as they pursue small insects [photo by Marvin Hyett]. After eluding birders for the entire weekend, the REDDISH EGRET of Forsythe re-appeared this morning in its "usual" spot, along the north dike and just before the dogleg. Additional sightings from the refuge this weekend included both Marbled and Hudsonian Godwits, and two Wilson's Phalaropes. Back in Cape May, Saturday night's rains were a bit more than we bargained for, with up to six inches falling over the southern portion of the county. Needless to say, a lot of previously good shorebird habitat has disappeared! However, the monsoon might have also created new habitat at sites like the Higbee dike or the West Cape May impoundments. A look at the weather map suggests that a cold front will slide past the Cape sometime on Tuesday, with northwest or north winds in the offing for at least Tuesday night into Wednesday. I would expect there to be a decent songbird flight, and perhaps hawk flight, on Wednesday. It appears that nobody has seen the REDDISH EGRET at Brig/Forsythe NWR so far this morning...hopefully it'll return! I understand that a Wilson's Phalarope was there yesterday, and good shorebirding conditions are underway right now, as east winds combine with some occasional rain. Perhaps a walk around the Meadows or a look at Bunker Pond will be required later. Folks should also take a look at the excellent list of birds that were seen at the Higbee Dike during today's rain-shortened morning flight count. How many times have you ever put Chuck-will's-widow, Golden-winged Warbler and Hudsonian Godwit on the same morning's list? Stone Harbor Point has always been among the most popular of Cape May County's summertime birding hotspots. 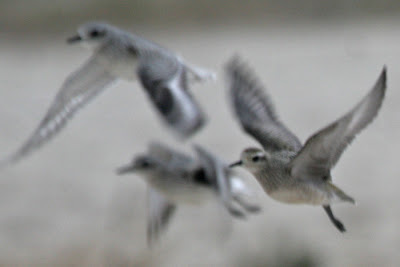 Thousands of southbound shorebirds utilize the site (particularly at high tide), threatened beachnesting birds attempt to breed here, and it's just a superb spot to view all sorts of bird and bug migration throughout the fall season. My visit to the Point this morning was focused on surveying Piping Plovers for the state's Endangered & Nongame Species Program, of which there were a decent number, along with various other goodies. Not pictured here are the 18 Brown Pelicans, 15 Caspian Terns and two Lesser Black-backed Gulls which also made their way onto my list. Even though the walk is long (the Point is growing in size, and it's now a little over a mile to get to the southern tip), and a large part of the habitat is closed to ensure space for nesting/roosting shorebirds, a trip to Stone Harbor is still a no-brainer in August. Plan a visit soon and let us know what you find! 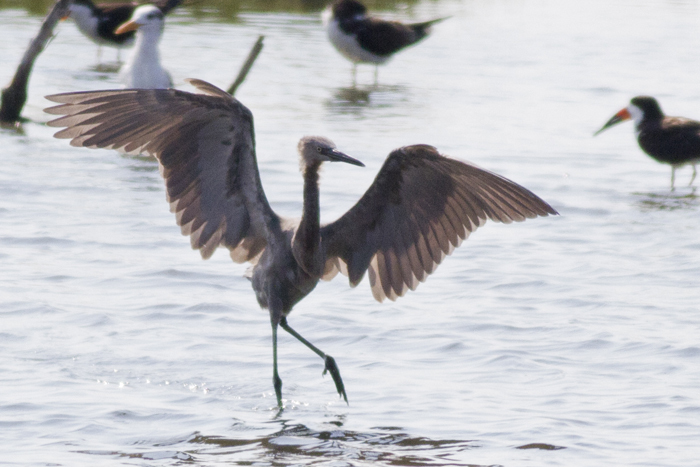 Reddish Egret - in case you hadn't heard! Just in case you hadn't heard , with fingers crossed that it stays through the weekend - a Reddish Egret was located at the Forsythe National Wildlife Refuge (aka Brigantine to us birders) on Thursday, 23rd and remains through Friday 24th at least. This great discovery was made by Jimmy Warren, a visiting Drexel student from Schwenksville, PA. This bird showed up only one day short of the only other New Jersey record, 14 years later and at the same location! If you go looking for the bird, don't go looking for red - this is a typical first year, dark-morph bird and is generally ash gray in color with a pale eye.. The following pictures were taken by Sam Galick and shows the bird in typical, crazy, dashing-around poses! This is the Cape May Birding Hotline, a service of New Jersey Audubon's Cape May Bird Observatory. This week's message was prepared on Thursday, August 23, 2012. Included this week are sightings of REDDISH EGRET, BLACK-BELLIED WHISTLING-DUCK, BRANT, AUDUBON'S SHEARWATER, WILSON'S STORM-PETREL, NORTHERN GANNET, AMERICAN GOLDEN-PLOVER, PIPING PLOVER, HUDSONIAN GODWIT, LONG-BILLED DOWITCHER, WILSON'S PHALAROPE, RED-NECKED PHALAROPE, BLACK TERN, SANDWICH TERN, EURASIAN COLLARED-DOVE, WHITE-WINGED DOVE, MERLIN, and RED-BREASTED NUTHATCH. 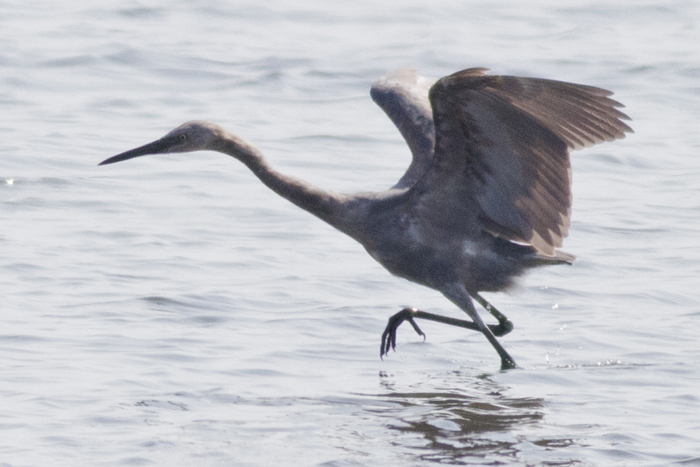 New Jersey's second REDDISH EGRET was discovered at Brig/Forsythe NWR on 8/23, and remained throughout the day. The bird spent most of the day along the north dike, about 200-300 yards east of the dogleg. Other recent highlights from "Brig" included WILSON'S PHALAROPE through 8/22, RED-NECKED PHALAROPE on 8/19, and BLACK-BELLIED WHISTLING-DUCK through at least 8/20. A WHITE-WINGED DOVE was seen flying south, and then later north, past the Higbee Dike during the morning of 8/20. The 8 RED-BREASTED NUTHATCHES which were counted flying past the dike on 8/22 could be a sign of things to come. Otherwise, songbird movements have been relatively light in recent days. 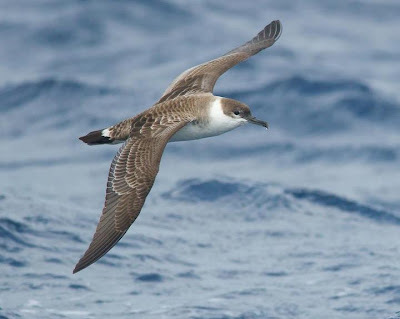 An AUDUBON'S SHEARWATER made a rare inshore appearance on 8/19, seen flying south past the Two Mile Beach Unit of Cape May NWR. 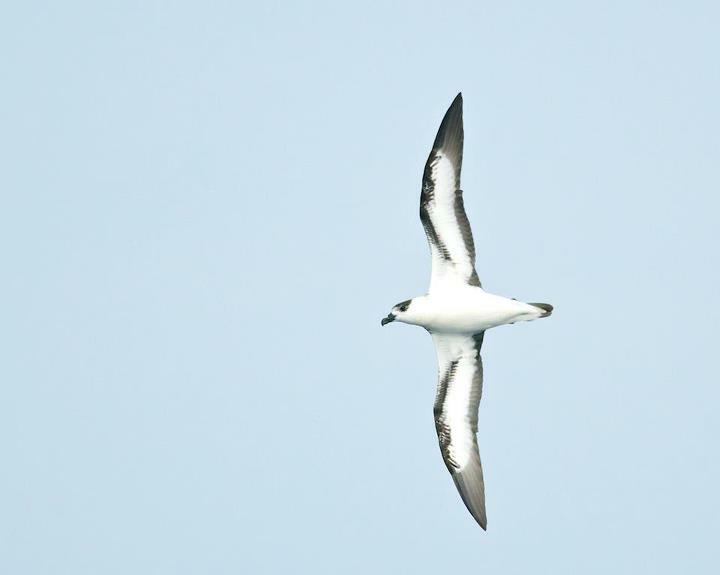 Birders on the Cape May-Lewes Ferry noted several WILSON'S STORM-PETRELS and a NORTHERN GANNET in NJ waters on 8/20. 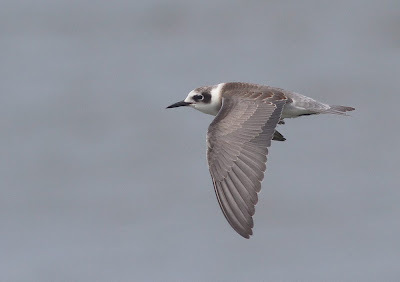 BLACK TERNS were in the news again this week, with appreciable numbers present along the Atlantic Coast south to Cape May and into the lower Delaware Bay. The period's high count came from Cape May Point State Park on 8/20, when a notable 74 were tallied flying west offshore. SANDWICH TERNS continued to occasionally frequent Cape May Point State Park through 8/23, while another was seen at Stone Harbor Point on 8/22. A HUDSONIAN GODWIT was seen flying north past the Higbee Dike on 8/22. 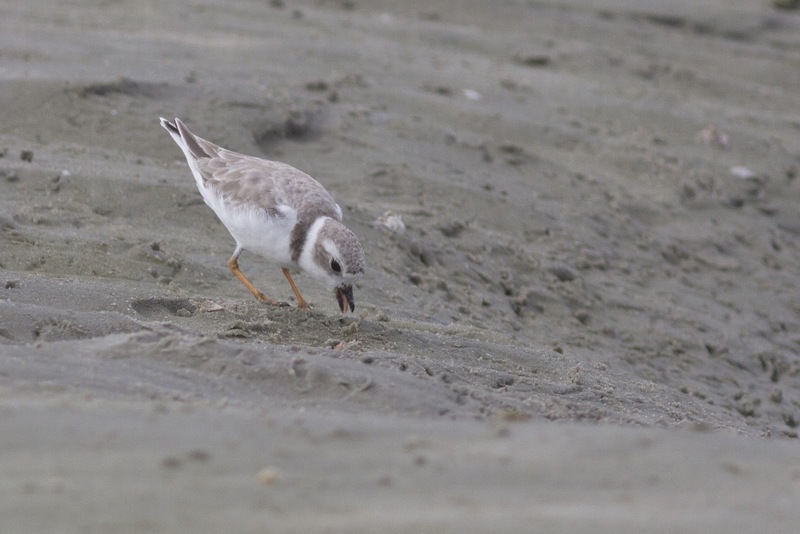 As many as 22 PIPING PLOVERS could be found at Stone Harbor Point last weekend, and AMERICAN GOLDEN-PLOVERS have been noted at Johnson Sod Farm (Cumberland County) during the past few days. 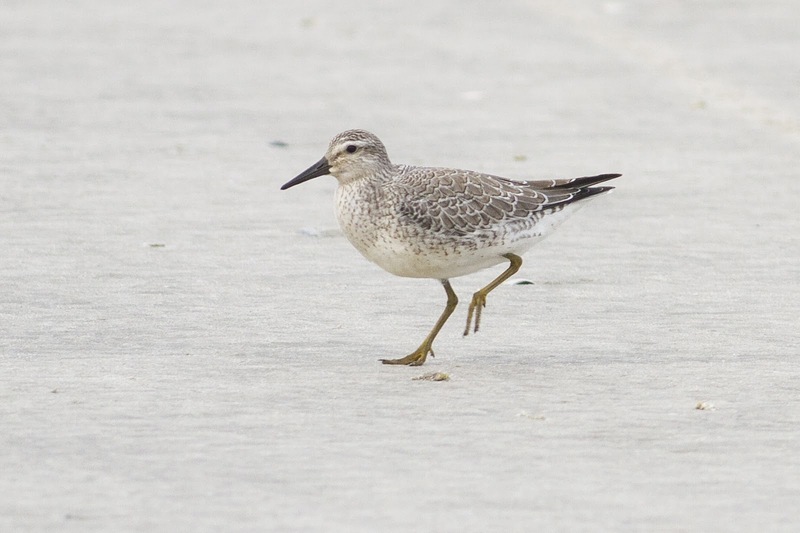 A LONG-BILLED DOWITCHER was at Cape May Point State Park on 8/23. Two slightly early MERLINS were seen flying past Cape May Point State Park on 8/22. An unusual August BRANT was found in Townsend's Inlet on 8/20. Cape May Point's EURASIAN COLLARED-DOVES also remain, with most reports continuing to come from the area of Yale, Whildin and Harvard Avenues. Most birders may think of August at Cape May as the month during which the landbird migration really gets going: morning flight, walking the fields at Higbees Beach W. M. A., the Beanery. For me, August brings mental images of shorebirds flying past the hawkwatch platform and, particularly, the amazing show that terns put on around Cape May Point. This is the place and time at which I finally buckled down and "learned" the terns. During August, the common local breeding species (Least, Common, Forster's) are present in large to huge numbers, the two regular southern immigrants (Sandwich, Royal) are present (Royals in variably large numbers), and migrants (Black) and rare local (Gull-billed) breeders are often findable. The adults of all species are molting body and wing feathers and run the gamut from nearly full alternate (breeding) plumage to very close to full basic (non-breeding) plumage. There are sub-adults that may not have bred but which have been wandering around the area all summer, initiating molt much earlier than the local adults and now looking quite adult-like. This August has seen one of the better Black Tern shows in my history here, even considering last fall's excellent show. Many were the texts on the local bird-text system conveying sightings of Black Terns, particularly at and near Cape May Point. 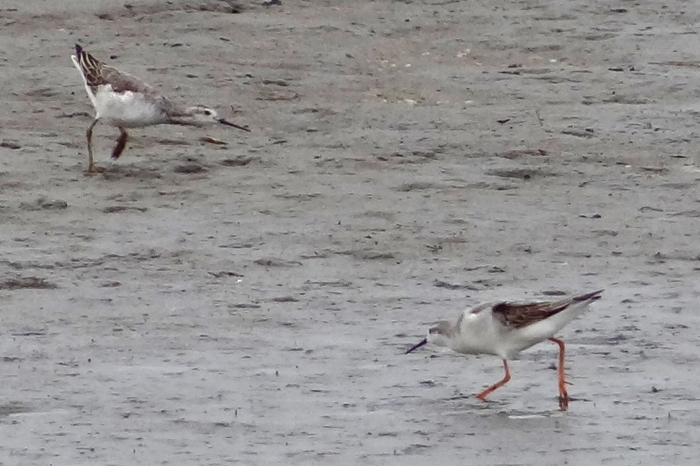 The species has been present on Bunker Pond for weeks, now, and gangs of them have been seen at immediately coastal locations, such as the various dune crossovers and the Concrete Ship (Sunset Beach). While Mike Crewe noted an excellent count of 31 at the Concrete Ship this morning (the report that got me out photographing the species today), Cameron Rutt's count of 74 passing eastward in front of the western dune crossover at Cape May Point S. P. on 20 August is the high count for the year, here. 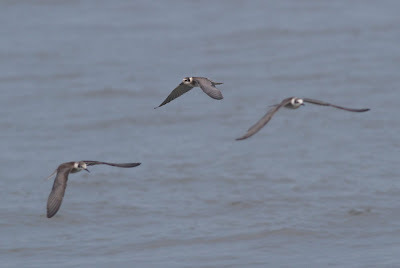 While there were a fair few adult Black Terns passing through in the early part of the month, the adult show is over here, so this post is about juveniles. For me, the very first item that I notice when looking at a Black Tern is the flight. The species has, for a tern, a languid style that immediately sets the bird apart from the common species of somewhat similar size (Common and Forster's). The other small tern, Least, has such a frenetic flight style as to bring to mind a shorebird, rather than a tern; not at all like the flight of Black Tern. 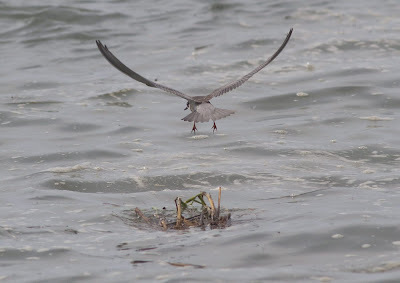 The only other tern that is regular here with a similar flight style is Gull-billed, which is probably not a coincidence, seeing as how they both do a lot of aerial hawking of insects and dipping down to pick items off the water's surface. The second feature is the darkness. No other Cape May-regular species even approaches that darkness. However, that darkness and different flight style may get some off on the wrong tangent, thinking about shearwaters or storm-petrels, rather than terns. 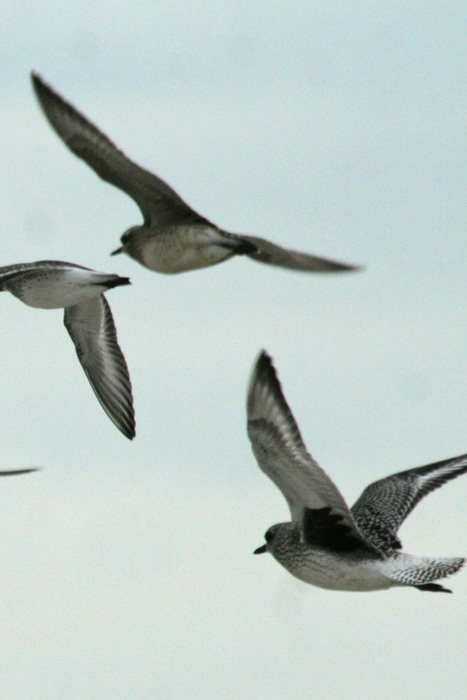 Fall is generally the best time of year for getting American Golden Plover on your Cape May or New Jersey list, and judging by the reports that have been around lately, they seem to be heading our way already. Recent reports have come from Brigantine and Malibu Beach in Atlantic County and Johnson's Sod Farm, up on the Cumberland/Salem County border. You might think that this is a relatively easy bird to find, but all that glitters on the beach is not necessarily gold and you don't want to be left with just a handful of Cape May diamonds! So here's a quick run through American Golden Plover and the most likely species to be on the beach with it should you find one - Black-bellied Plover. The following photos are of late season birds and I took them on South Cape May Beach in late October 2010; in brighter, August sun, both species will look much brighter and more spangled on the upperparts. If you intend going out to look for your own American Goldie, it is also as well to remember that this species is as likely to turn up inland on a sod farm or turned over farm field as on a coastal beach - perhaps more so. A group of large plovers on the beach on a dull October day. From a distance, there is very little to choose from them? Which is the goldie? Well, of course you always go for the one in the middle of the picture because that is what the photographer was photographing! But it is clear to see here that there is very little to go on in overall color; goldies rarely look golden, except in full breeding plumage in spring while, conversely, black-bellies can actually look browner than might be expected. Moving in with the scope, we can start to ignore the overall color similarities and home in on the subtle differences. Here a Black-bellied Plover is at left and an American Golden Plover right (with another black-belly in the top right corner) All these birds are juveniles and show pretty much the same color on the upperparts. To me the most obvious feature of the goldie is the dark cap, making the white supercilium over the eye look much more obvious. Next comes the noticeably smaller and finer bill, without the chunkiness of the black-belly bill. Other features may be more subtle, but still useful: the goldie has a more contrasting white throat due to the more heavily marked breast - which looks more checkered than streaked; the flanks look subtly barred not streaked and, of course the bird is smaller. Another flight view, again showing that uniform gray underwing of an American goldie, but against a different colored background. Also interesting to note is the white underwing on the top left Black-belly, at an angle where the black axillaries cannot be seen - so it's not always straightforward! Luckily the birds wheel round and land again - I didn't scare them off before anyone else saw them!! An upperside view in flight gives us another classic Black-belly feature - the large white patch on the tail and uppertail coverts. This feature can often be visible on settled birds too, particularly if preening. 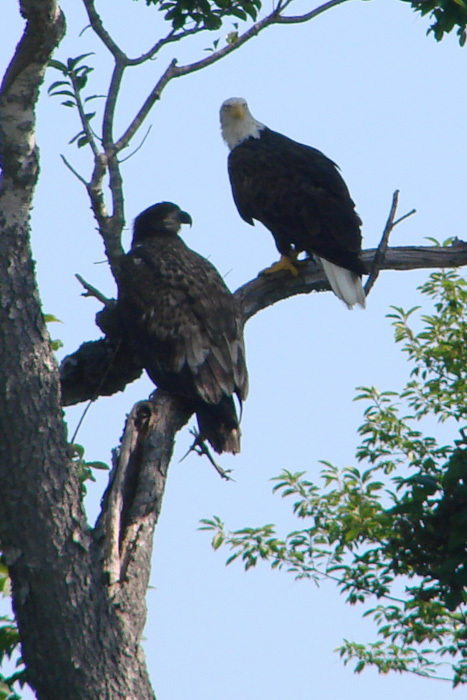 The American goldie (here on the right) is solidly dark in this area and it also shows a lot less white in the wing. 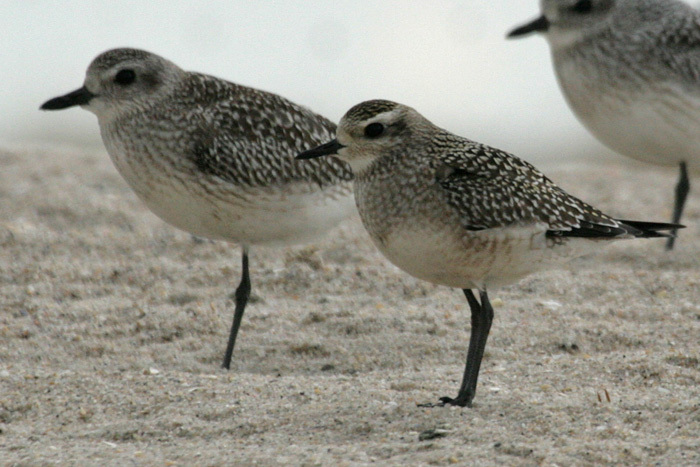 Keep a good look out for these smart birds and let us know if you find one; if you have what you think is an American Golden Plover with Black-bellied Plovers, the size difference will usually be apparent and all those subtle differences can be directly compared. If you have a single bird and you are not sure which you have, forget the overall color and work your way through the other features - cap and throat contrast, underwing color, uppertail color, and bill size. Good luck!! Warblers and terns continued to provide good birding at Cape May today. Mourning Warblers continue to excel themselves, with one of two reported from Higbee Beach this morning breaking into song! Blue-winged and Canada Warblers also put on a show again at Higbee Beach and an Alder Flycatcher was at the Northwood Center. 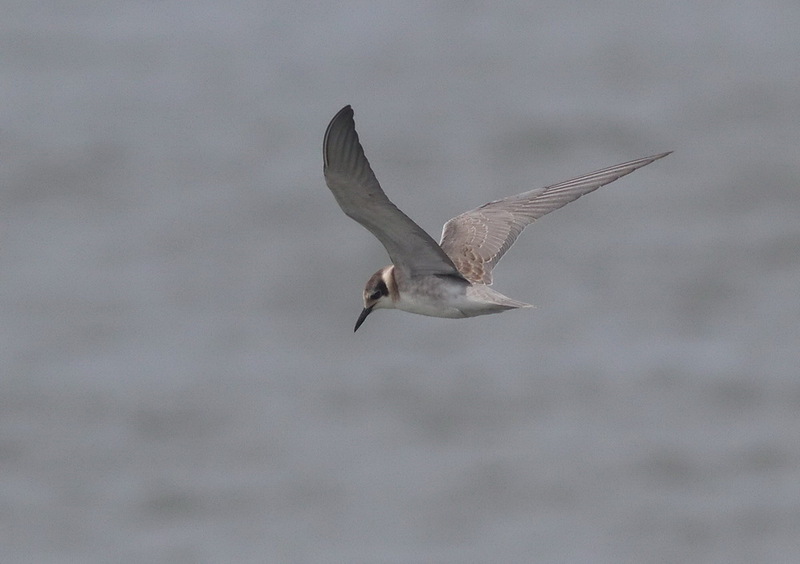 Michael O'Brien added Sandwich Tern to his yard list as two flew over, heading for the point and were later relocated on the beach near the lighthouse. Black Terns continue to be very much in evidence this year with up to 11 reported from Sunset Beach and three at Bunker Pond. 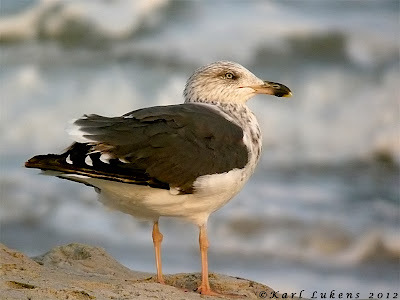 The South Cape May Beach continues to hold Lesser Black-backed Gulls and, if you are in the vicinity of the Cape May Canal, keep an eye out for young Bald Eagles which are showing up there fairly regularly now. The Beanery is still hosting both Baltimore and Orchard Orioles, several Blue Grosbeaks, Wood Ducks and a scattering of warblers. Don't rely on yellow legs if you are looking for Lesser Black-backed Gulls! Sub-adult birds such as this one are more readily told by the dark gray upperparts. Notice the difference here between the newly molted, innermost primaries with their bold white tips, and the brownish black, old outer primaries with no white [photo by Karl Lukens]. Looks like our local Bald Eagles have at least one youngster again this year. Though they nest less than a mile from my house, I haven't seen any youngsters at home yet so I am not sure just how many are around, but Bob Lubberman took this picture along the Cape May canal recently. This summer we tried a new idea - adventures off the beaten track around Belleplain State Forest. It's certainly been great fun and, though the birding has been quiet during the sultry days of summer, there has been an amazing array of other wildlife to enjoy as we've explored meadows, swamps, lakes, woods and even roadsides (and not forgetting that wonderful moth light of course!). With just two more Sunday morning walks to go, you just have time to get in on the fun before birding down at Cape May Point really gets serious! Here's what we were up to last week. On one or two occasions, conditions have been right for us to get into some fabulous wetland areas around Belleplain; such fragile wildlife communities have to be treated with care so as not to damage them, but there's some great wildlife there if you are careful [photo by Mike Crewe]. Though generally widespread and common, arrowheads are declining in Cape May County due to loss of good freshwater habitat. 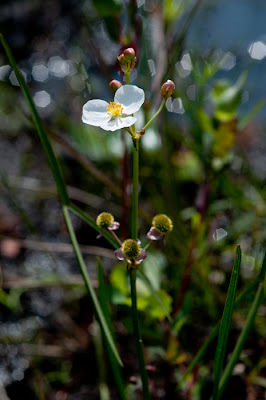 Engelmann's Arrowhead is the commonest species here [photo by Hugh Simmons]. 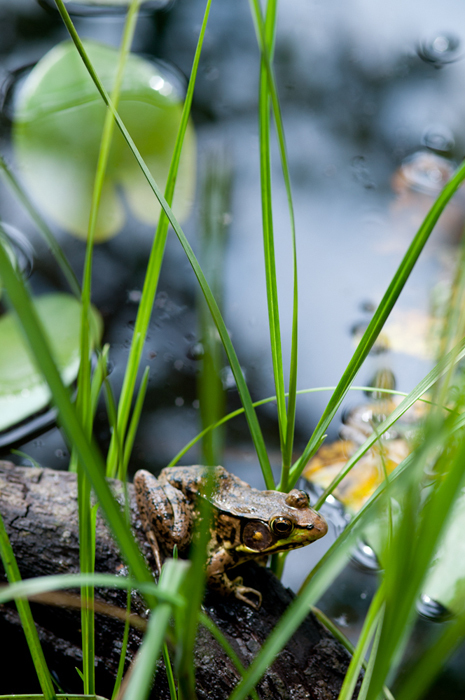 The subtleties of wetland habitats allow for some attractive wildlife photography with a little care. Hugh Simmons photographed this Southern Leopard Frog on last Sunday's walk. The 'blue' skimmers of Cape May can be tricky to identify at times, but when they settle right next to you, things get easier! This male Bar-winged Skimmer shows off the subtle dark bar on the leading edge of the forewing that gives it its English name [photo by Mike Crewe]. It's fair to say that a little nervousness hit the group when Tiger Bee Flies showed up and hovered around us. They are not harmful to us Humans, but carpenter bees need to watch out since these guys larvae are parasitic on the larval and pupal stages of carpenter bees [photo by Mike Cewe]. And talking of being parasitic! Robber flies are used to getting their own way in the insect world as they are quite large and spend their time hunting down smaller insects. However, this one has fallen prey itself to a Chinese Mantis. This is a large mantis species which is capable of eating many things that our native mantis wouldn't be able to cope with. Sadly, people are encouraged to release this non-native species into the environment, where it does unknown damage to native insect populations [photo by Mike Crewe]. So how do we get to some of the far flung corners of Belleplain? Well, when the group is small enough and the vehicles are tough enough... [photo by Mike Crewe]. See you at the next Belleplain Wildlife walk, Sundays through August at 10:30AM. This is the Cape May Birding Hotline, a service of New Jersey Audubon's Cape May Bird Observatory. This week's message was prepared on Thursday, August 16, 2012. Included this week are sightings of TOWNSEND'S WARBLER, BLACK-BELLIED WHISTLING-DUCK, WILSON'S STORM-PETREL, OSPREY, MISSISSIPPI KITE, BALD EAGLE, BROAD-WINGED HAWK, PIPING PLOVER, AMERICAN AVOCET, HUDSONIAN GODWIT, MARBLED GODWIT, BUFF-BREASTED SANDPIPER, BLACK TERN, SANDWICH TERN, EURASIAN COLLARED-DOVE, AMERICAN KESTREL, BANK SWALLOW, BARN SWALLOW, RED-BREASTED NUTHATCH, BLUE-GRAY GNATCATCHER, LOUISIANA WATERTHRUSH, GOLDEN-WINGED WARBLER, MOURNING WARBLER, AMERICAN REDSTART, YELLOW-RUMPED WARBLER, YELLOW-THROATED WARBLER, WILSON'S WARBLER, and DICKCISSEL. This week's standout bird was a TOWNSEND'S WARBLER, discovered at Brig/Forsythe NWR on 8/13, along Lily Lake Road and just east of the Noyes Museum. The bird was only in view for about 10 minutes and has not been seen again. Other highlights from "Brig" this week included the continuing BLACK-BELLIED WHISTLING-DUCK through 8/16, HUDSONIAN GODWIT on 8/16, and AMERICAN AVOCET on 8/12. A MISSISSIPPI KITE was briefly viewed over the South Cape May Meadows on 8/16 during a small early-season hawk flight that also included multiple AMERICAN KESTRELS, BROAD-WINGED HAWKS, OSPREY and BALD EAGLES. A nice songbird flight also occurred on the morning of 8/16, with the following highlights tallied from the "dike" at Higbee Beach WMA: 313 BLUE-GRAY GNATCATCHERS (apparently a new single-day mark), 240 EASTERN KINGBIRDS, 178 AMERICAN REDSTARTS, 2 early YELLOW-RUMPED WARBLERS, 2 LOUISIANA WATERTHRUSHES and a YELLOW-THROATED WARBLER. Two MOURNING WARBLERS could be found in the fields at Higbee Beach WMA on 8/16, and another was at CMBO's Northwood Center on 8/15. A GOLDEN-WINGED WARBLER, 3 MOURNING WARBLERS, 2 WILSON'S WARBLERS and a RED-BREASTED NUTHATCH were present in the Higbee fields on 8/13, while a DICKCISSEL was seen over Cape May Point State Park on 8/12. Over 1,200 BARN SWALLOWS and about 50 BANK SWALLOWS were tallied moving past the dunes at Cape May Point State Park on 8/16. Large numbers of PURPLE MARTINS continue to stage along the Maurice River near Mauricetown (Cumberland County). A BUFF-BREASTED SANDPIPER visited the beach in front of the South Cape May Meadows/Cape May Point State Park on 8/16. 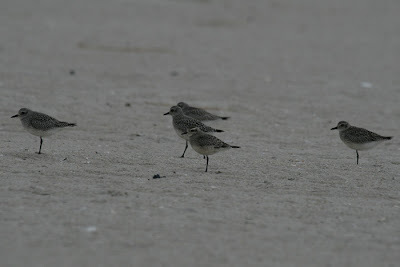 23 PIPING PLOVERS were present at Stone Harbor Point on 8/12, and 2 MARBLED GODWITS were seen at Nummy Island on 8/13. BLACK TERN numbers increased this week, with a high of 17 from Higbee Beach WMA on 8/16, plus additional sightings from Cape May Point, Stone Harbor, Brig/Forsythe NWR, and perhaps most notably, 4 inland birds over the Villas, also on 8/16. A SANDWICH TERN was seen in Bunker Pond at Cape May Point State Park on 8/16. Seawatching hasn't been overly productive recently, but a WILSON'S STORM-PETREL was seen from the Coral Ave dune crossover in Cape May Point on 8/14. Cape May Point's EURASIAN COLLARED-DOVES also remain, with most reports continuing to come from the area of Yale, Whildin and Harvard Avenues. **CMBO's Northwood Center will be CLOSED for inventory on Monday, August 27 and Tuesday, August 28. **CMBO'S Center for Research & Education will be CLOSED for inventory on Thursday, August 30 and Friday, August 31. Northwood Center: Open 9:30am-4:30pm, Wednesday-Monday; closed Tuesday. Center for Research & Education: Open 9:30am-4:30pm, Tuesday-Saturday; closed Sunday and Monday. Dragonflies counted flying north past Miami Beach, Villas, Cape May Co., NJ, 16 August 2012. Perhaps two things stand out as of particular interest here; firstly, the relatively low numbers of other dragonfly species compared with the high numbers of Swamp Darners - why so many of a single species? 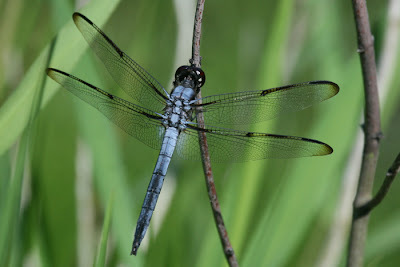 Secondly, the presence of Great Blue Skimmers, which are not normally thought to be migratory. 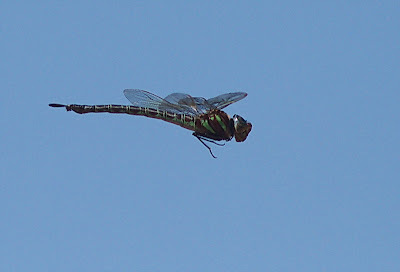 Swamp Darner - one of over 1700 counted heading north at Villas today [photo by Tony Leukering]. Higbee Beach put on a nice show this morning, for what was the first Morning Flight Count of the 2012 season. This year's counter, Cameron Rutt, will no doubt have the figures up for you soon on our Seasonal Research page, but I do know that over 300 Blue-gray Gnatcatchers were counted there this morning and unusual sightings included two Yellow-rumped Warblers and a total of 17 Black Terns. In the Higbee fields, warblers were showing well too, with Prairie Warbler and American Redstart being the two commonest species, while highlights for me at least included Canada and two Mourning Warblers, four Baltimore Orioles and at least 10 Empidonax flycatchers, which appeared to include at least one Willow, one Least and two Alder Flycatchers. Blue-Gray Gnatcatcher - a major movement of this species took place through Cape May today [photo by Tony Leukering]. So far today, the Northwood Center trees have provided Blackburnian, Chestnut-sided, Black-and-white, Prairie and Yellow Warblers, American Redstart and Baltimore Oriole, while a Mississippi Kite was seen from both the South Cape May Meadows and Rea Farm and a Buff-breasted Sandpiper was on the beach between the state park and the meadows. The backbays are holding some nice birds for our boat trips right now - including this Marbled Godwit that was seen from The Skimmer recently [photo by Ginny Powell]. Further afield, Pete Dunne tells me that Purple Martins are still roosting along the Maurice River in good numbers, with count estimates peaking at 200,000 on August 11th. An awesome spectacle, best viewed from the bridge over the river just outside Mauricetown. A reasonable flight at Turkey Point, Cumberland County this morning included 246 Eastern Kingbirds, 25 Bobolinks and a scattering of warblers - as well as five Bald Eagles. Dainty Sulphurs on the way?